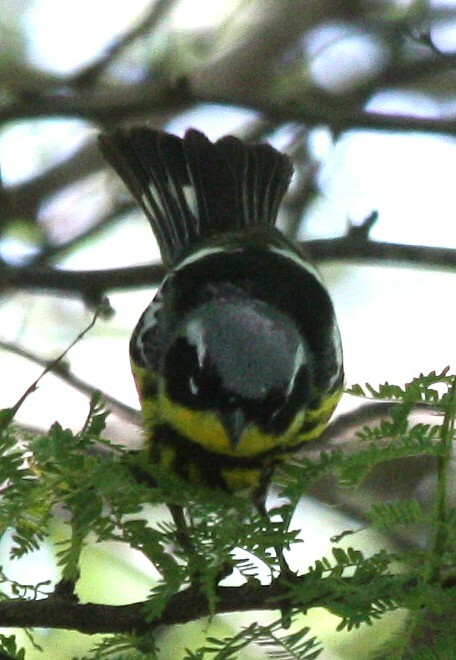 I had just gotten home from this month-long Texas April Blitz (the up-side of being laid off, I guess...), but with the report of a Slate-throated Redstart at the SPI Birding Center, I asked some friends if they wanted to head out there Saturday. Pat Heirs was the only one to take me up on it, so out we went bright and early, picking up a Chihuahuan Raven on the way. 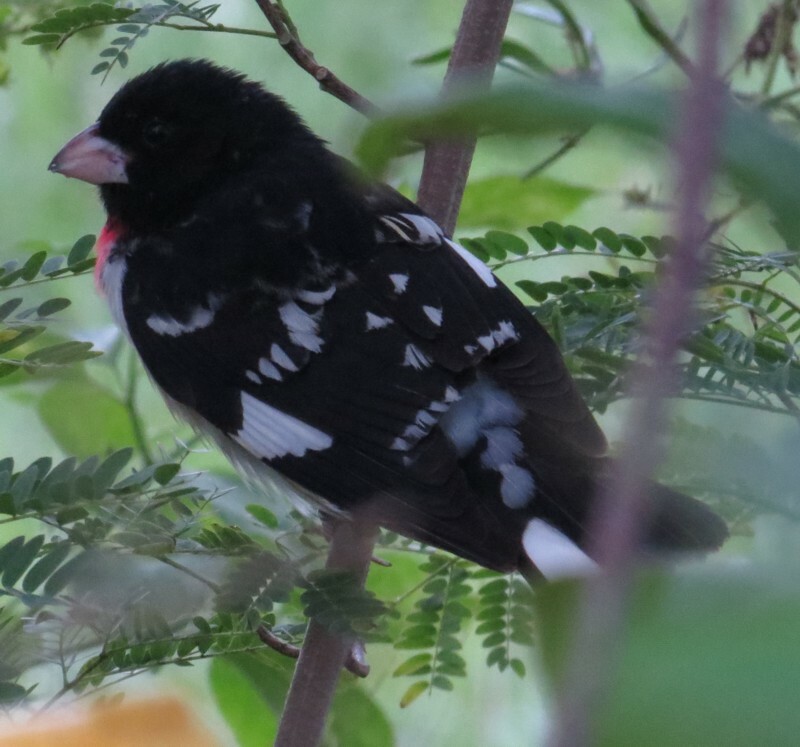 Even though the Birding Center wasn't open yet, they were encouraging birders to walk around the side of the building to get to the boardwalk and butterfly garden (where the bird had been seen), and also had a box where one could leave a donation. 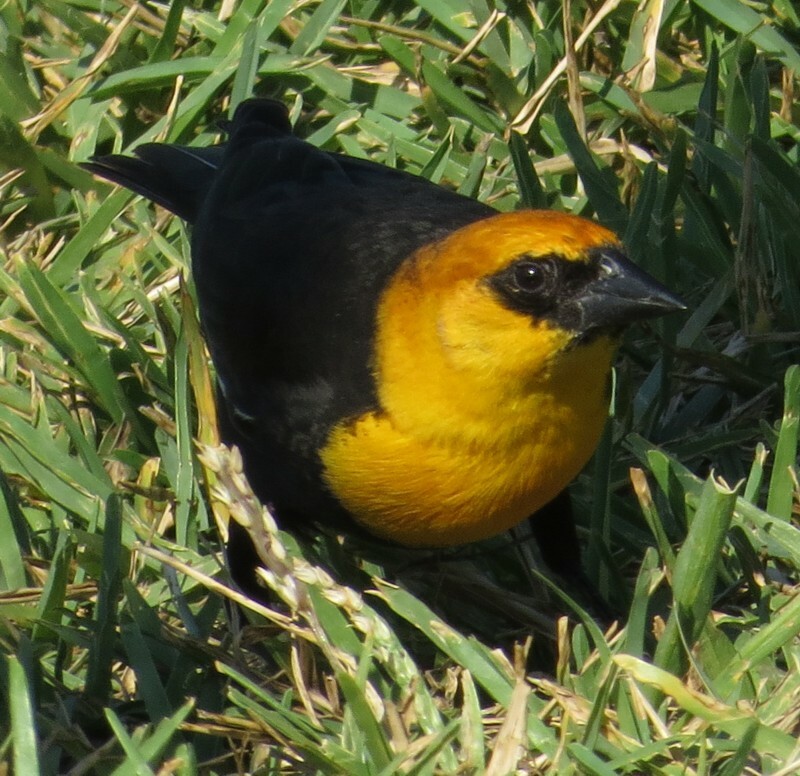 But first we checked the chain-link fence surrounding the water tower, as not only had the redstart been seen there, but a Golden-crowned Sparrow as well! 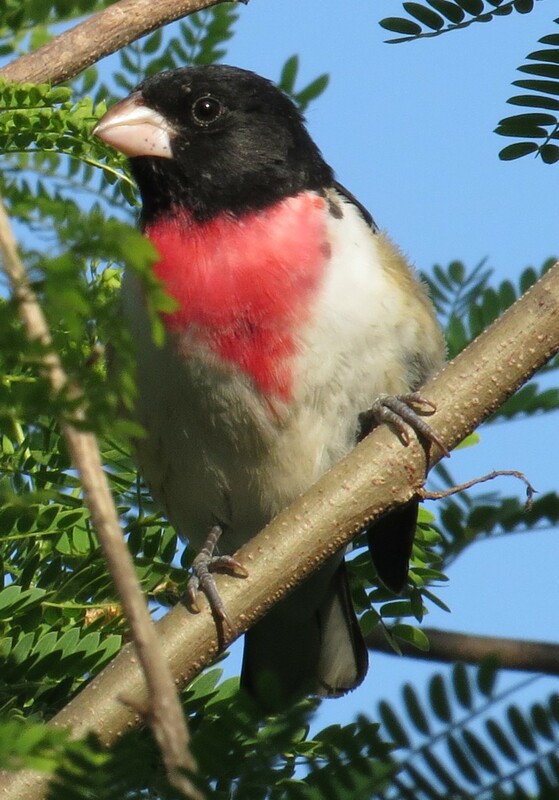 Neither was there, so we made our way to the garden where we were immediately greeted by a Scarlet Tanager and a Rose-breasted Grosbeak! 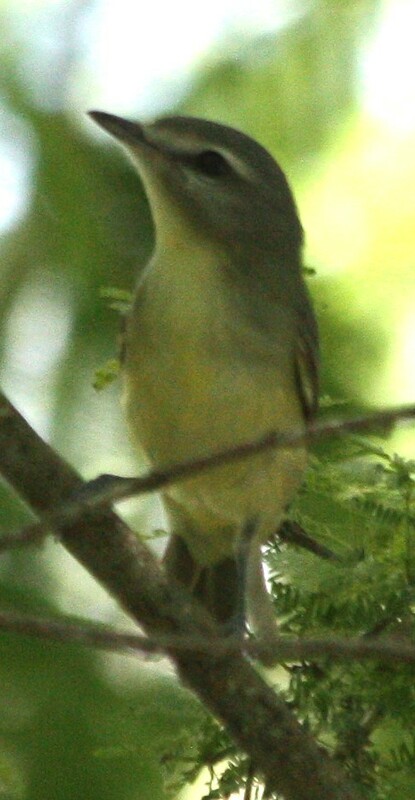 A female Summer Tanager was also hanging around, along with a few Tennessee Warblers, and the Mottled Duck family was very entertaining as some of the ducklings ran on ahead of momma, and three others got so engrossed in feeding that they got left behind, and shortly went running after momma! Not having seen our target birds we went ahead and checked the boardwalk, where a very cooperative Clapper Rail was out in the open! We also found a Dickcissel sitting up, and a few shorebirds out on the mudflats. 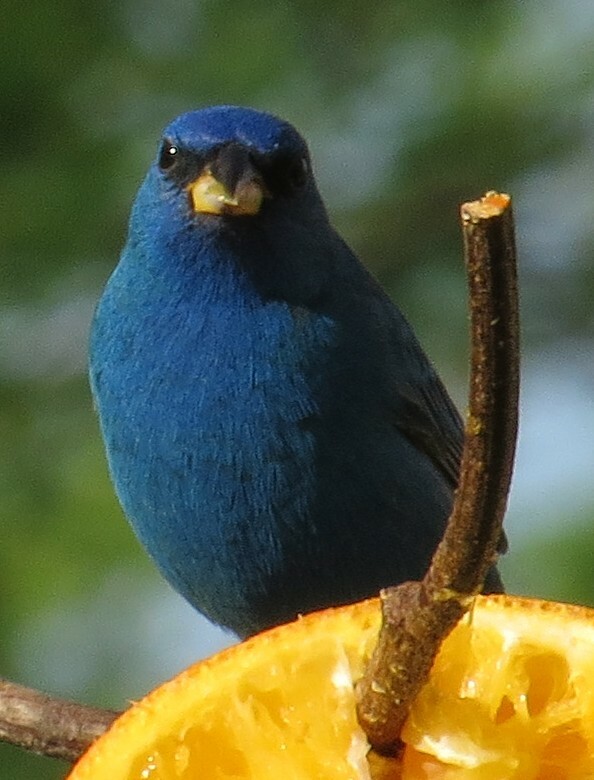 Nothing really out of the ordinary showed up (except maybe the Belted Kingfisher - that was a bit late). A pair of Oystercatchers wheeled by on our way back, and a little later we got a kick out of them waiting underneath an Osprey's pole for any scraps of fish that might fall while the Osprey was enjoying breakfast! 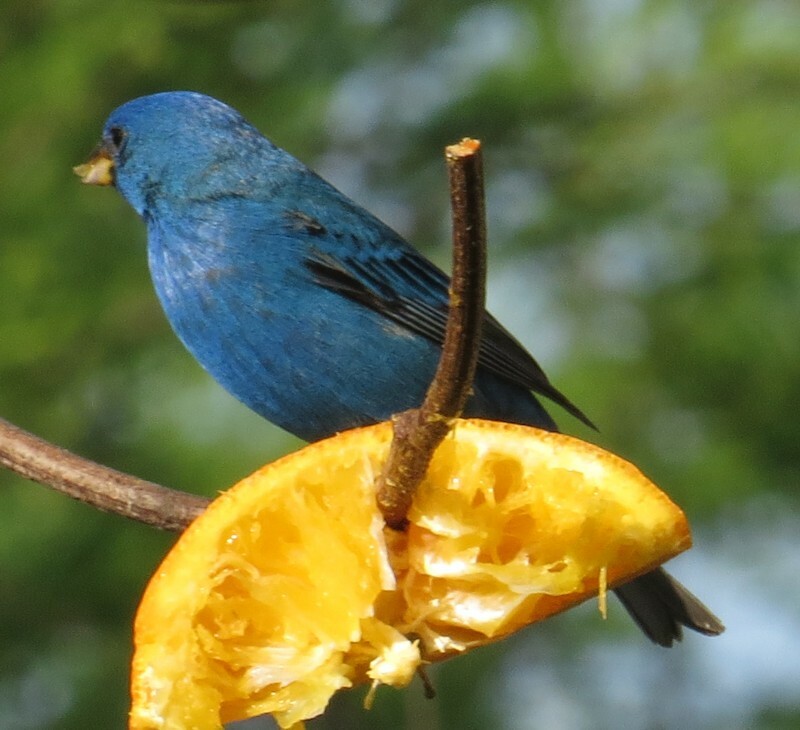 On the way out to the cars a brilliant Indigo Bunting was chowing down on an orange, so much so that his lower mandible was stained orange! 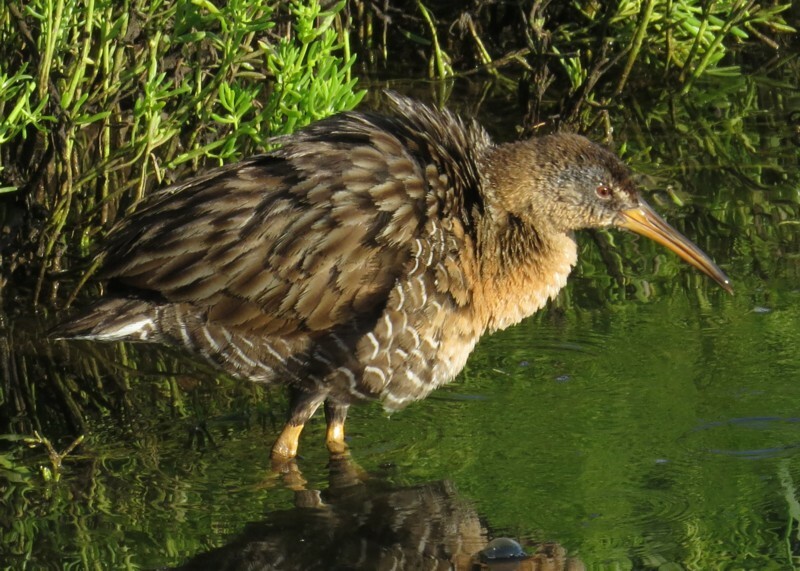 Two of the Clapper Rails along the boardwalk: one in the shade and one in the sun! 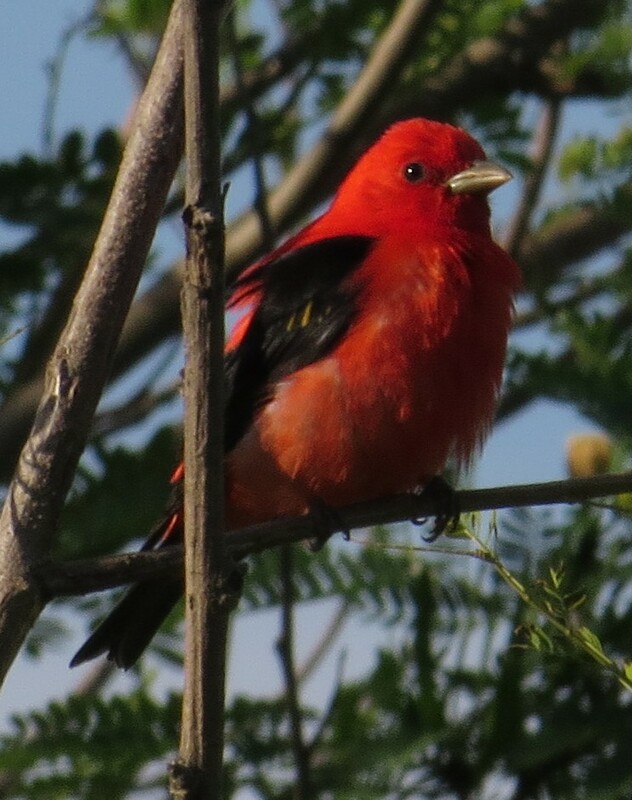 On the way back the Scarlet Tanager is out in the sun now! These American Oystercatchers aren't dumb - they're hoping to get a fallen scrap from the Osprey's lunch! 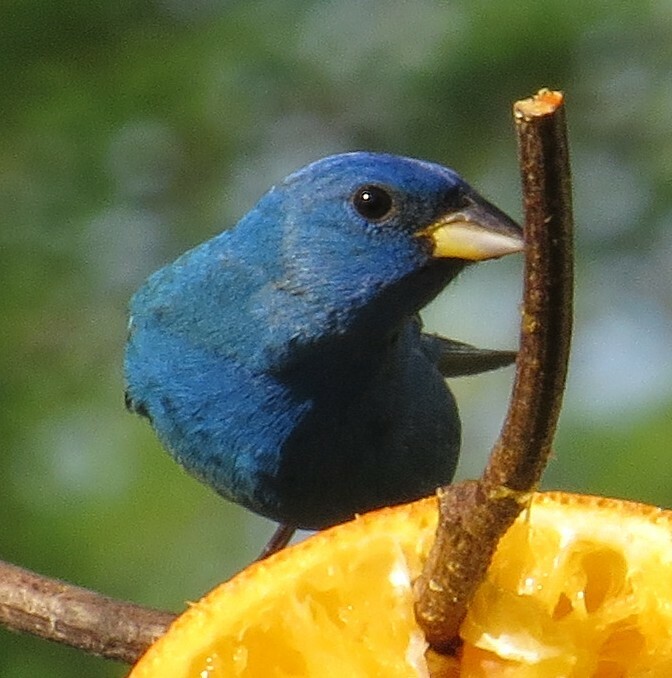 This Indigo Bunting's bill is stained orange from the orange! From there we headed over to the Convention Centre, and it was here I believe we ran into Sue Griffin and her friend Stephanie (I believe her name was). 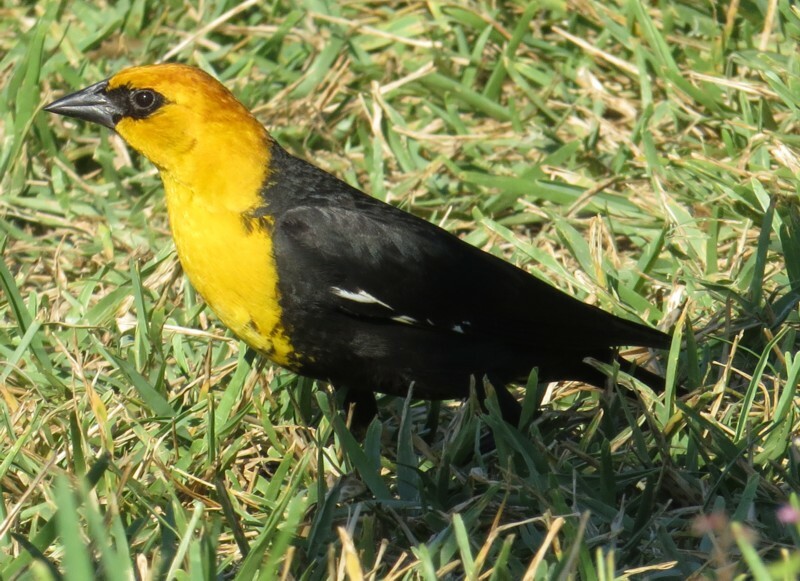 There was a little more action here, and the first goodies to greet us were a couple of Yellow-headed Blackbirds that Pat teased me about almost running over (I was trying to get as close to the curb as I could)! 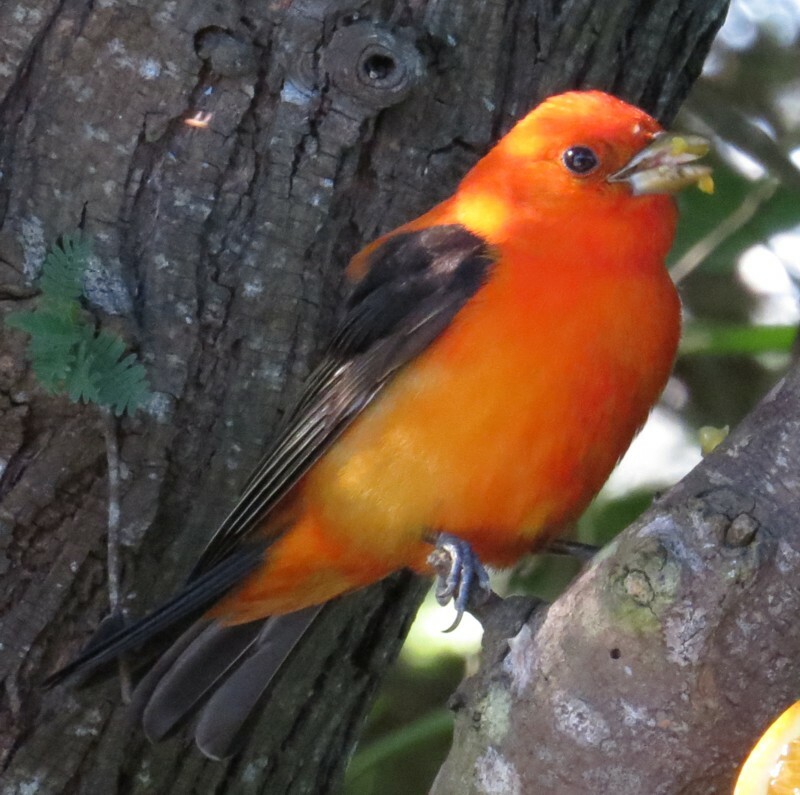 Baltimore and Orchard Orioles liked the bottlebrush coming in, and the place was lousy with Swainson's Thrushes! 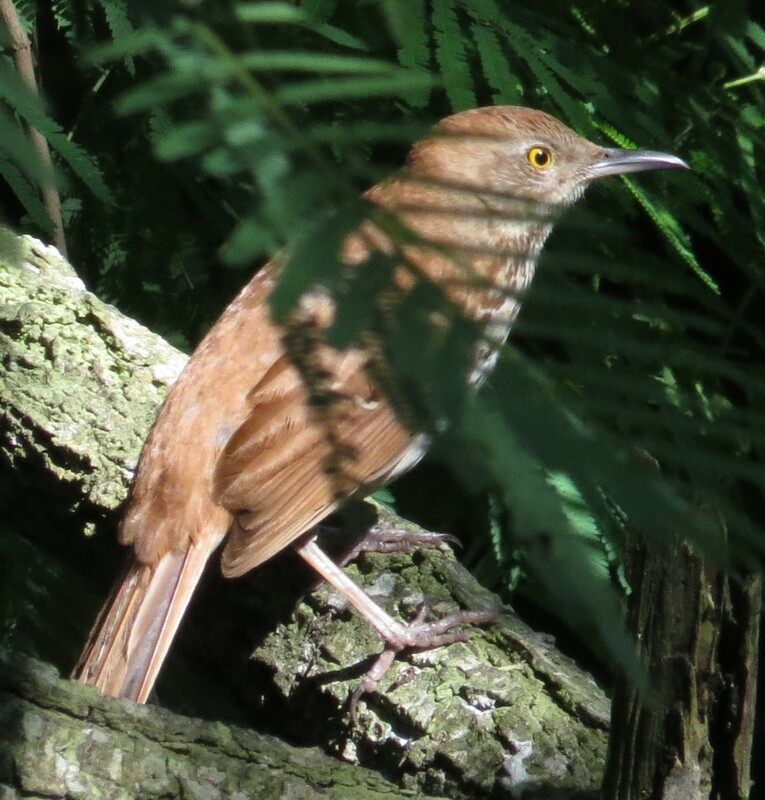 Pat needed Gray-cheeked and I needed Veery, but Sue and Stephanie had been enjoying the vagrant Brown Thrasher coming in on the north end of the "back yard"! I wasn't sure, having dealt with really rusty-looking Longbills in the past, and this bird looked rather plain-faced and long-billed at first, but the pictures revealed what I'm comfortable calling a real Brown Thrasher, especially after comparing the photos with other Brown and Long-billed photos (and something else I never noticed, although this may not be diagnostic: the streaks on the Brown appear more rusty-looking, whereas on the Long-billed they're really black)! 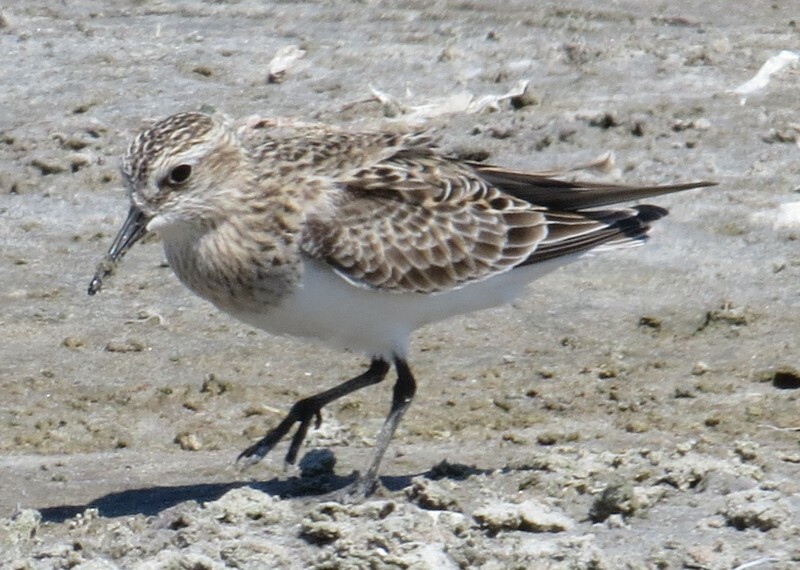 Unfortunately Pat only saw the back as it flew out, as she went out to the overlook to look for shorebirds. 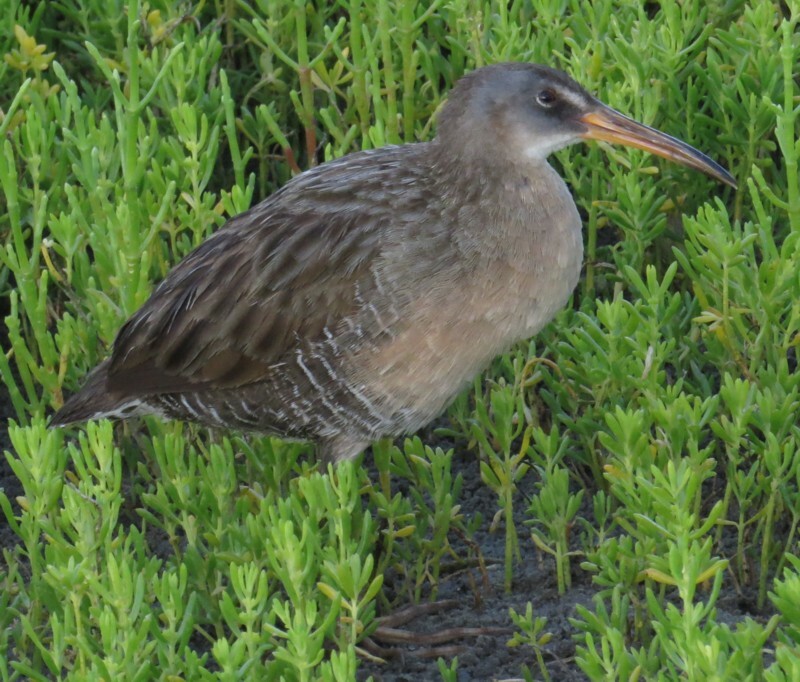 There were also a couple of Northern Waterthrushes hanging around here. 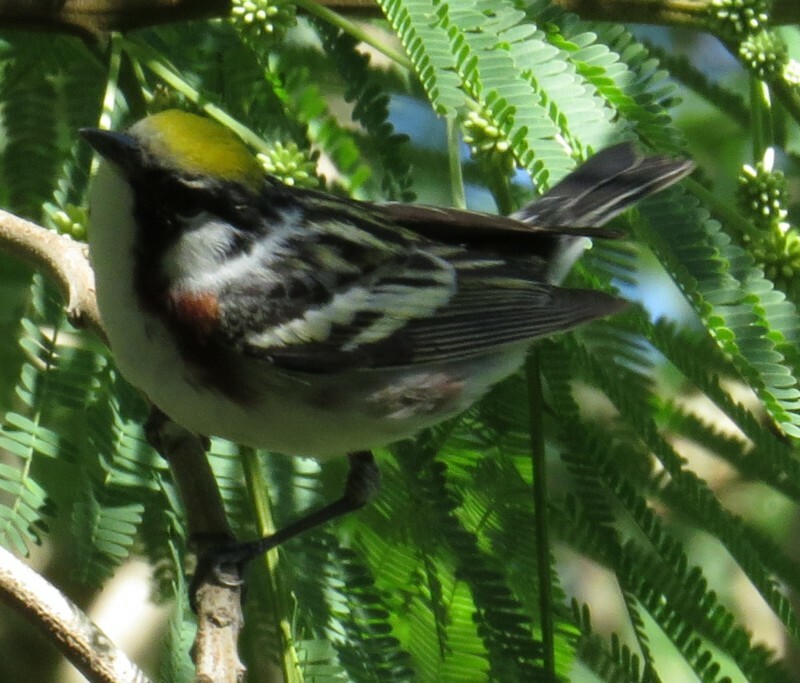 Since we visited the CC twice, what we saw when kinda blurs together, but we also had Black-throated Green, Magnolia, and Chestnut-sided Warblers in addition to the Tennessees, plus several Catbirds coming in to the oranges. 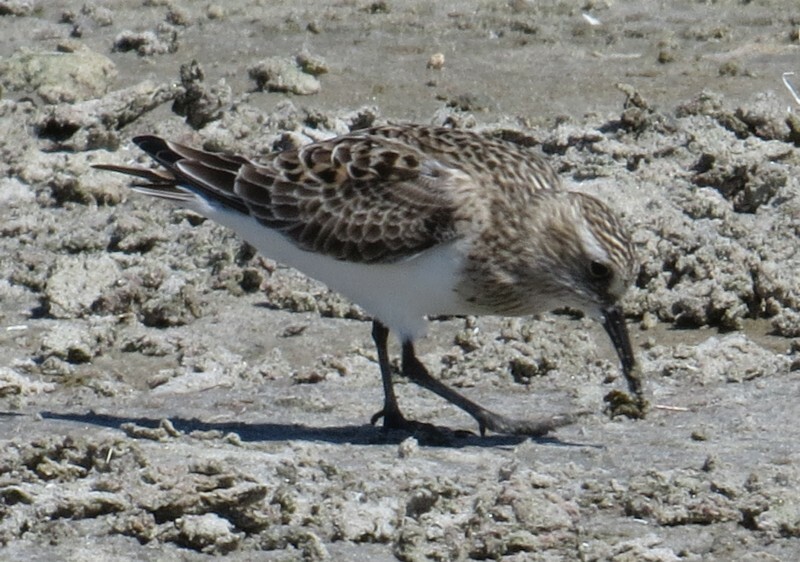 We strolled the boardwalk (along which we had a burbling Marsh Wren and several nice shorebirds, including a Wilson's Plover), where we enjoyed watching the various Hermit Crabs over the railing and a single Blue Crab. Then we all piled into Diggory and cruised the bayside access as the tide was way out, and that was pretty productive: right away we had a close Baird's Sandpiper in with some Sanderlings for good comparative views, and the larid flock consisted of skimmers, Laughing Gulls, and four species of tern. Swinging over to the north side we had a single Piping Plover in with some Semipalmated Plovers, and further out we had two Snowy Plovers! 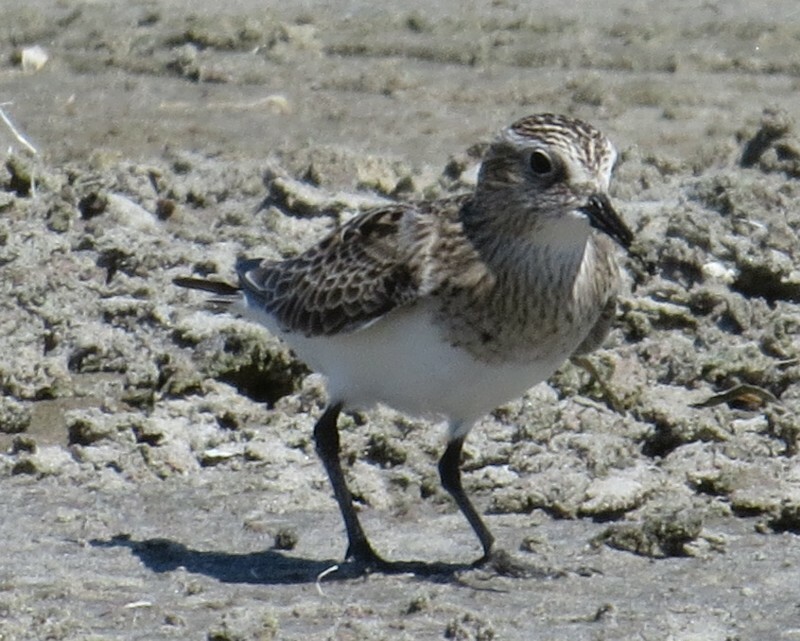 Other pretty shorebirds in breeding plumage included turnstones, Dunlin, and Short-billed Dowitchers; a Marbled Godwit also came sailing in to join them. 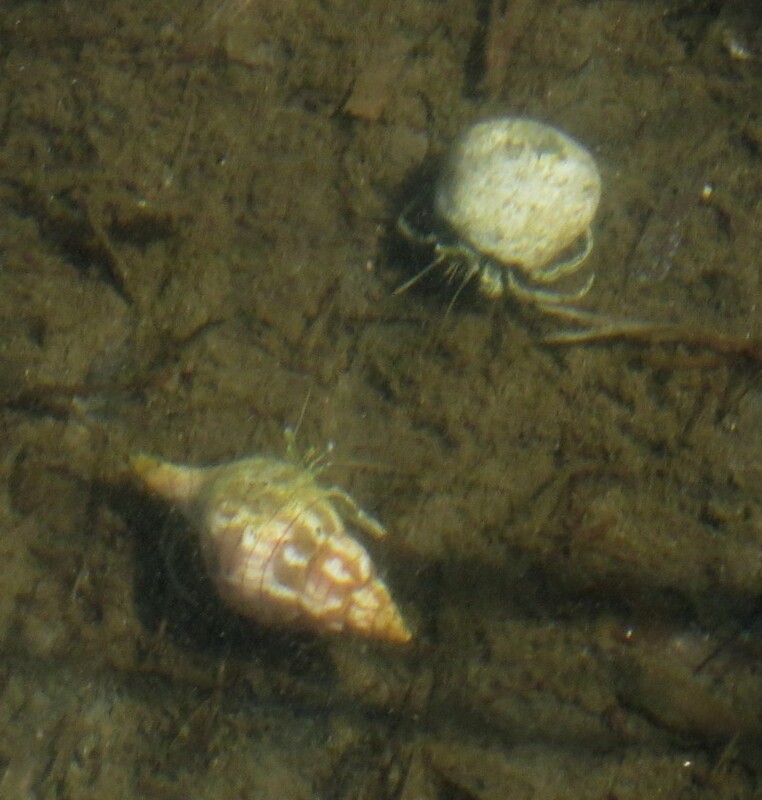 A couple of Hermit Crabs enjoy different kinds of shells as homes! We dropped Sue and Stephanie off after which Pat and I got a Subway, then headed over to Sheepshead. It took a few minutes for things to start moving, but Pat spotted my year Veery, and across the street she spotted a female Painted Bunting. 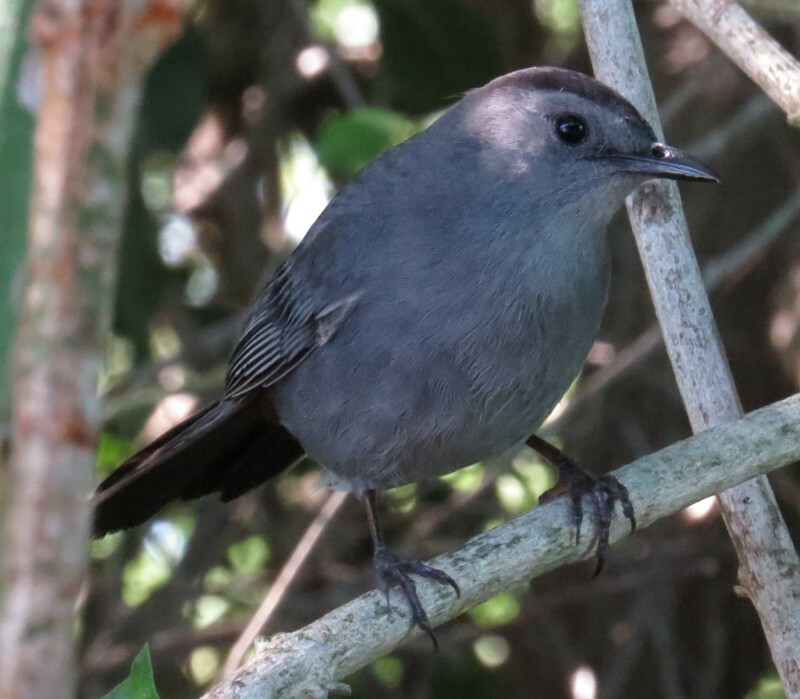 Brad McKinney had shown her a spot where a Loggerhead Shrike liked to hang out, and sure enough, there he was (briefly, anyway)! 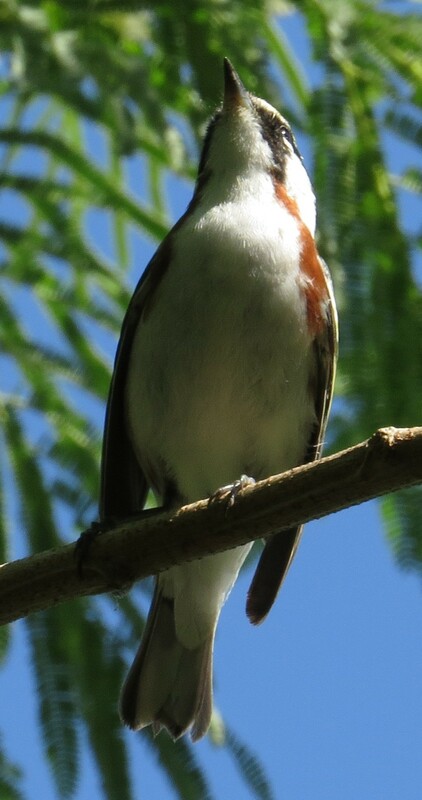 We poked down a couple of side streets (Lazuli Bunting had been reported on one of them), but saw nothing but another Swainson's Thrush, so we returned to the Convention Centre, where things were hopping even more! 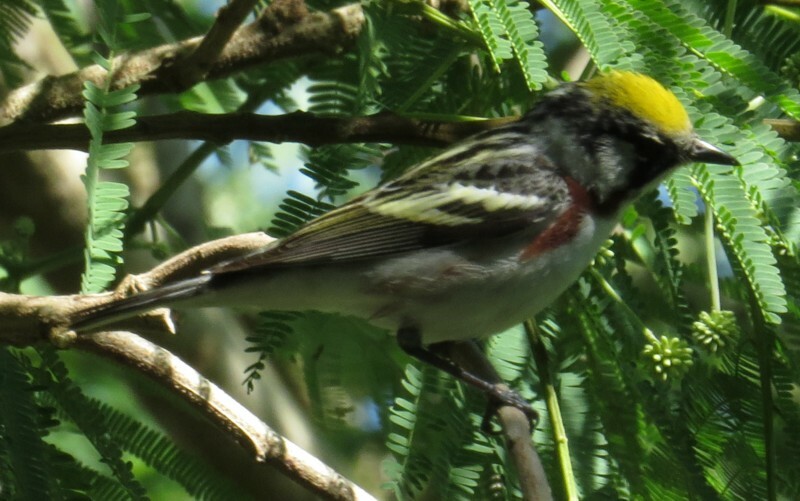 A Chestnut-sided Warbler was bathing in the water feature, and the minute I left to switch cameras (the battery in the Powershot dies about lunchtime...), a Blackburnian had come in! 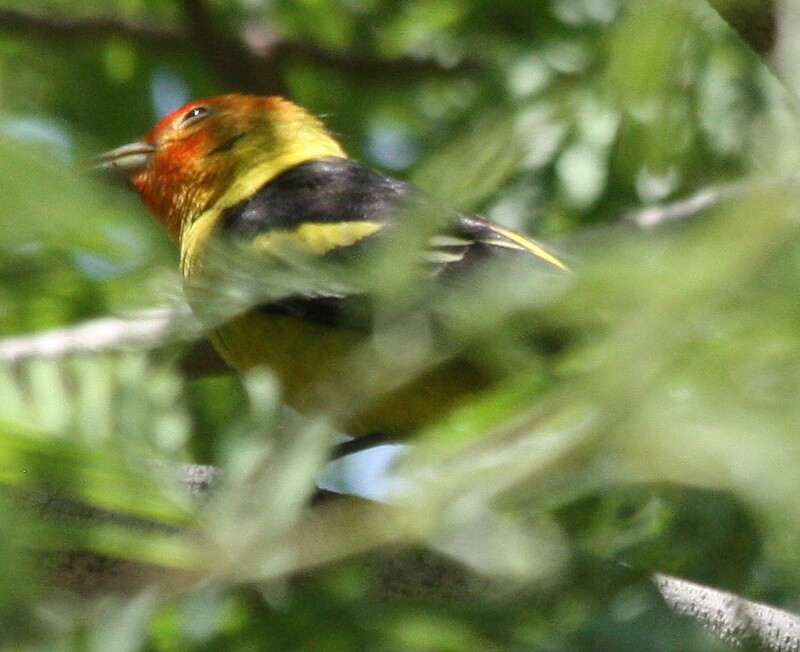 When I returned I waited in vain while Donna McCown and I gabbed, then Pat came running to get me as the Western Tanager had shown up! 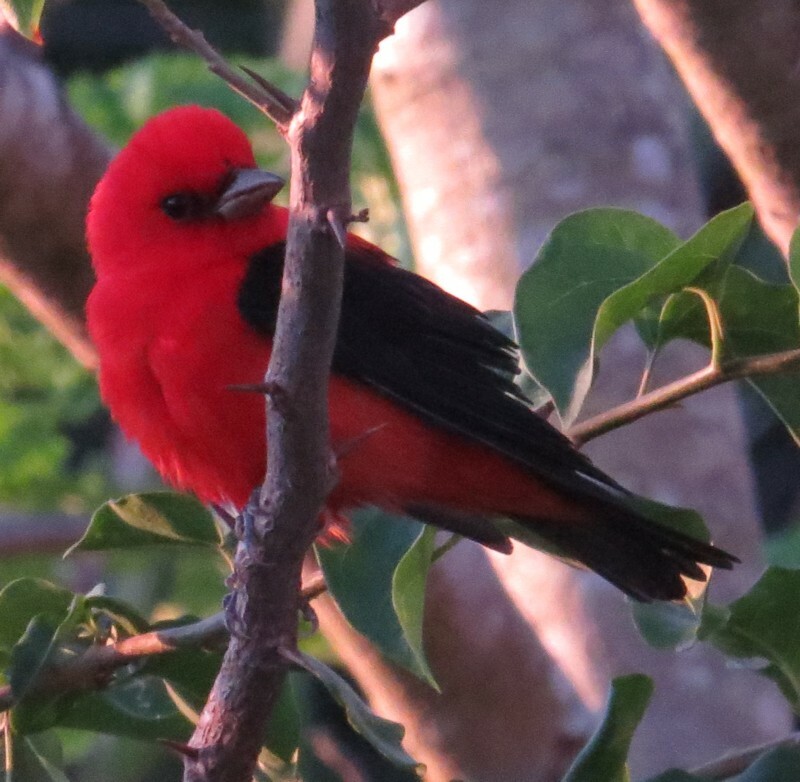 So I got to see him (a real beauty), along with an orange Scarlet Tanager! 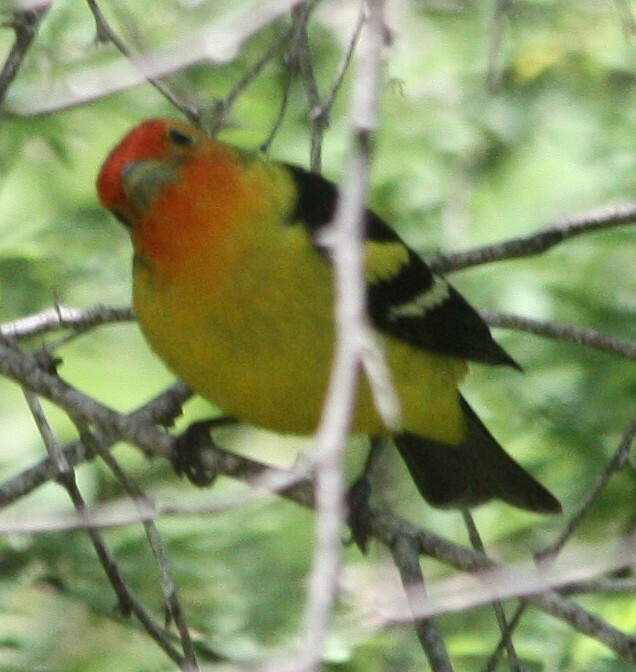 Western Tanager, an annual vagrant in the Valley. We decided to sit at the "thrasher bench" for awhile in hopes that it would show up; Robin Zurovec was already there (Troy was busy putting out oranges; we had brought some of those along with mangoes to see how that went over with our neotropical migrants, as tropical birds go nuts over them at these lodges), so we gabbed some more while trying to turn one of the many Swainson's Thrushes into a Graycheek. 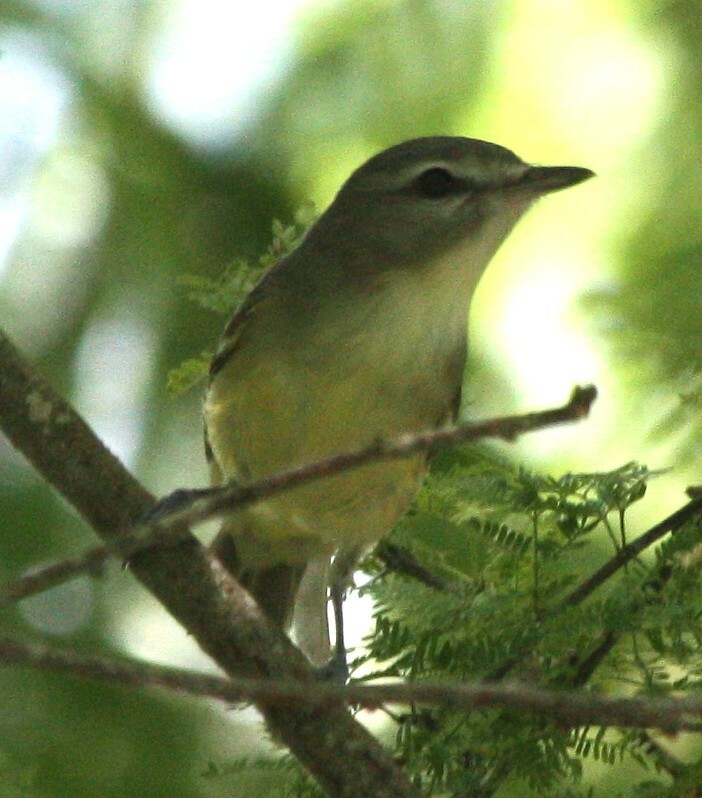 Scarlet showed up soon after with her two doggies, so she got to enjoy the Philadelphia Vireo and Magnolia Warbler that showed up! I was still holding out for a Townsend's, and a robust chink from down the "lane" got me over there post-haste, but it turned out to be an ultra-aggressive Tennessee... But somewhere in here the Blackburnian finally showed up, and let several of us get some nice views!